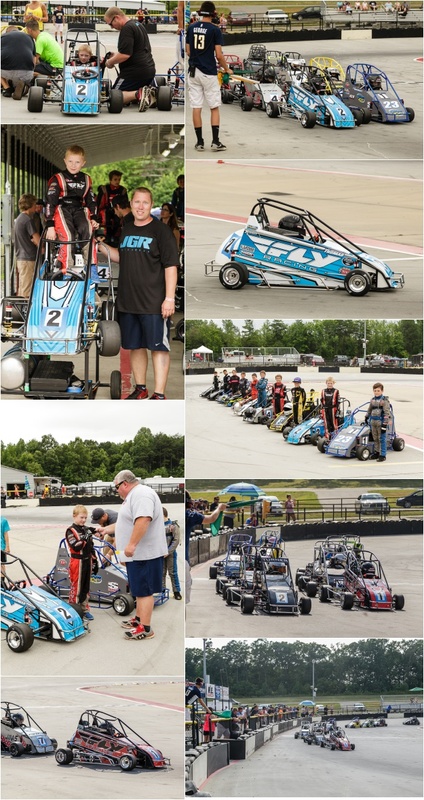 6/25/16 - Dillon did an awesome job qualifying on Saturday! He qualified 2nd in Jr Honda and 3rd in Jr Animal (just 0.002 out of 2nd). They inverted the top 3, so he started 2nd in Jr Honda and 1st for Jr Animal. This was our Jr Honda Cup Race, so Dillon got to be pulled out onto the track to music and was interviewed before the race. During the race, he tried to go for the lead a little too early and ended up spinning out. He finished 9th. In Jr Animal, we were unfortunately wrecked under caution before the race started, which knocked off the chain. After coming off the track to get the chain fixed, Dillon had to go to the back of the field for the start of the race. He ended up finishing 5th. Dillon has improved so much since the start of the year and we are so proud of him!